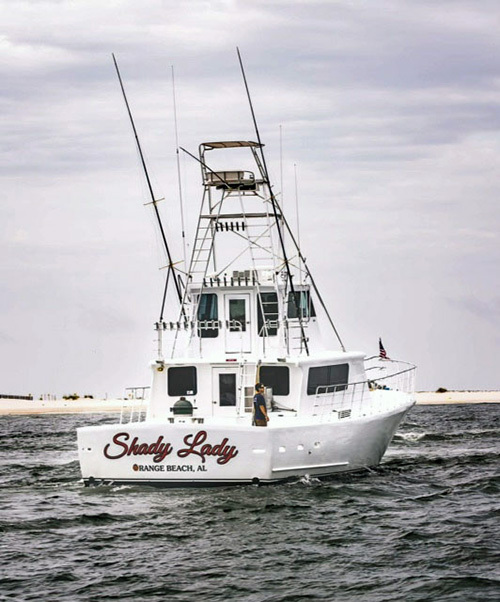 The Shady Lady is a custom built sport fishing vessel that has a reputation as being one of the most stable fishing hulls ever built. 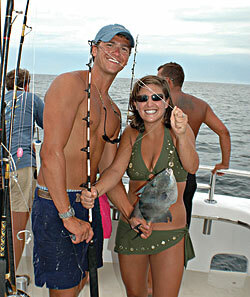 This allows our customers to have a comfortable fishing experience in most any sea condition. We have also installed a Coast Guard Certified bow rail system that allows easy access to the bow while under way. 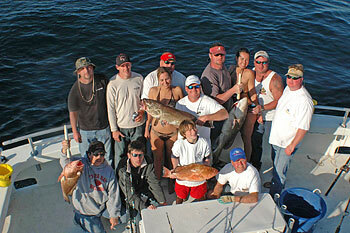 It also allows for comfortable fishing for large groups giving them more fishing area. 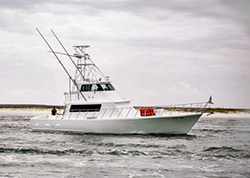 When fishing for Dolphin, Cobia and even large bottom species, the bow area makes a roomy and safe fishing platform. The Shady Lady sleeps up to 8 people in the 3 state rooms and has 2 baths and a large walk in shower that feels great after cranking up big fish all day and night. The salon area is extremely spacious with plenty of seating or sleeping area. From the salon you will have easy viewing of the beautiful Gulf due to our newly installed lightly tinted windows. In the salon you will find the galley, which is equipped with microwave, refrigerator freezer, sink, coffee maker, and plenty of utensils for grilling and meal preparations. For increased interior comfort on those humid summer days the Shady has 2 separate Air Conditioning units. On long-range trips we provide clean sheets, pillow cases, blankets, towels, as well as soap for showering at no extra charge. The Shady crew believes that safety and service is our most important goal to insuring a good trip. All our crew has been certified in CPR and first aid, we also believe in a drug free fishing environment that requires our crew to be subjected to random drug testing. Our crew will educate everyone before and during the trip on safety and will gladly provide additional help with children if needed. The Shady is equipped with well stocked first aid kits, 2 large Coast Guard certified life rafts, satellite EPIRB system, dual VHF’s and satellite phone. Our crew also prides itself in being good cooks, especially on the Green Egg. The Shady is stocked with plenty of spices and marinades, but feel free to bring what ever you might like, heck they might learn something new. The Shady is perfectly set up for 2-4 day trips seeing we installed two new fuel tanks giving us 1200 gallons of total fuel. For those big fish catches the Shady has a custom ice maker on the back deck, and the crushed ice is also great for an afternoon drink. As far as fresh water we are equipped to hold over 300 gallons of filtered water. This makes for great accommodations for overnight and 2 day Tuna, Wahoo, Dolphin, Marlin, Sword, and Shark fishing trips. We also offer dinner, weddings, and funeral cruises.